Iggles Blitz » Blog Archive » On the Move? The Eagles have lots of interesting decisions to make in regard to who gets re-signed and who gets let go. There are some interesting decisions beyond those. One of the key questions for the offseason is figuring out where to play certain players. Avonte Maddox – The rookie DB started at nickel, CB and FS in 2018. He showed a lot of promise and must be a starter in 2019. But where? If the Eagles let go of Rodney McLeod, then moving Maddox to FS would make a lot of sense. Maddox covers a lot of ground and takes good angles to the ball, a critical skill for a deep safety. He is a good tackler. Maddox has good ball skills. 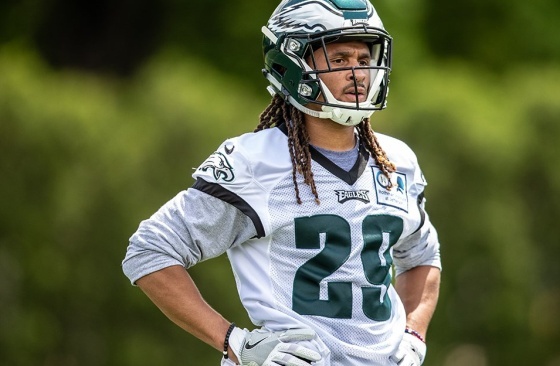 I think Cre’Von LeBlanc will be the nickel in 2019 so that means Maddox is playing outside or at FS. Rasul Douglas – Douglas played well down the stretch and in the postseason. He seemed to find a home at RCB. Douglas tackled well and was good in coverage. On the other hand, he didn’t go up against top receivers or get tested that much. When the Rams did go after him, they had some success. As I watch Douglas play, I see a safety. He has the best ball skills of anyone on the team. He can hit and tackle. While he isn’t overly fast, Douglas can cover ground as a long strider. If the Eagles bring McLeod back, moving Douglas to safety would make a lot of sense. They could use dime sets with Jenkins in the box and McLeod and Douglas back deep. Douglas played well enough this year that he must be in the mix to start, but I don’t see him as a lock. Jalen Mills – Get him into the Red Zone and Mills is an outstanding corner. The problem is the first 80 yards of the field. He played pretty well in 2017, but struggled in 2018, as teams went after him over and over. Jim Schwartz loves Mills, but there are more options at CB now. Mills could transition to safety. He could also become a backup. Sidney Jones – Jones began 2018 in the slot. He played pretty well, but then had to deal with injuries and eventually moved outside. Jones has shown signs of the talent the Eagles expected when they drafted him in the 2nd round, but he has not played at a high level consistently. Jones is in the mix for a starting CB spot on the outside. He won’t be guaranteed anything. The Eagles could play him in the slot as well in case LeBlanc slips from his 2018 form. Matt Pryor – The rookie OL spent most of his time in the spring/summer of 2018 playing RG. Jeff Stoutland said he felt Pryor was a natural at RT so he wanted him to focus on learning to play the OG spot. Now that Brandon Brooks is rehabbing an Achilles injury, the Eagles need a good plan for RG. They could slide Stefan Wisniewski to that spot. They could give Pryor a chance. Pryor will be cross-trained to play multiple positions, but he has to focus on one spot. It will be interesting to see if that is still OG. Pryor struggled there last summer. The Eagles could decide to let him focus on RT to build his confidence and just mix him in at RG. Nigel Bradham – Jordan Hicks has been the Eagles MLB for the past few years. Bradham has been the SAM. Hicks is a free agent and might be moving on. The Eagles could shift Bradham to the middle and then let Kamu Grugier-Hill and Nathan Gerry man the outside spots. I’m sure they would also draft a player to add to the mix. Dave Spadaro wrote an interesting piece on players who ended the season on IR. This caught my attention. This could be a tricky situation. Jalen Mills has a foot injury serious enough that he missed half the season and wasn’t close to returning in the playoffs. Is he going to be OK for 2019? Think about the challenges for a cornerback with a foot injury … he needs all the mobility and change of direction available. There is no word on when Mills will be good to go, so let’s hope he makes good progress in his rehab. He was missed in 2018. That’s an interesting description…”tricky situation”. Maybe the Mills injury will linger into the offseason. If so, that could make his bid for a starting job a lot more complicated. Tricky, if you will.